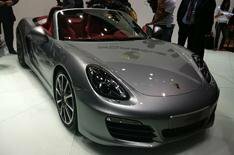 Geneva motor show 2012: Porsche Boxster | What Car? This the new Porsche Boxster, which is on display at the 2012 Geneva motor show and goes on sale in April. The 2012 Boxster is all-new; its lighter than the car it replaces, more fuel efficient and, Porsche says, more agile. The new body has a longer wheelbase and wider track than the current model. Porsche says the new Boxster is considerably lighter, thanks to more advanced construction, but it hasnt released any figures. New flat-six engines provide the power: the Boxster has a 2.7-litre unit with 261bhp, a 9bhp increase over the outgoing Boxster. Average fuel economy (with PDK transmission) is 36.7mpg, a 5.7mpg improvement. The Boxster S has a new 3.4-litre unit: it has 311bhp, a 5bhp increase over todays Boxster S. Average fuel economy is 30.1mpg, a 5.2mpg improvement. Porsche claims the Boxsters reduced weight will make it more agile; it also gets a new electro-mechanical power steering system and therell be the option of a Sports Chrono package and Porsche Torque Vectoring (PTV) system with rear limited-slip-differential. The new Boxsters styling evolves the look of the current car. Theres a more sculpted look, with deeper side air intakes, squarer headlights and a spoiler that flows into the rear lights. The interior has a new look, inspired by the Porsche Carrera GT supercar and Panamera luxury car. Theres more space for driver and passenger, Porsche says, and extra high-tech kit. Standard equipment for the Boxster includes Alcantara trim, 18-inch alloy wheels and a 7-inch touch-screen. The Boxster S adds part-leather trim, xenon headlights and 19-inch alloy wheels. Prices for the Boxster start at 37,589, a 1017 increase on the current model. The Boxster S starts at 45,384, a 1584 increase. The Boxster goes on sale on April 28.